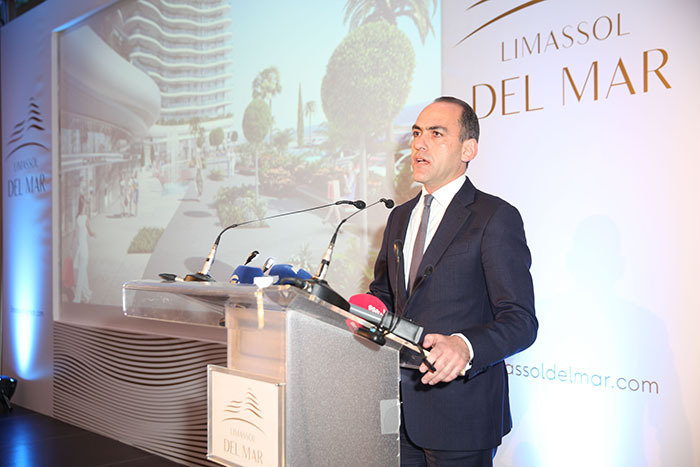 On October 6, 2017, a large-scale event took place - a solemn ceremony of laying the foundation stone for a new project Limassol Del Mar, which will be built in the tourist area of ​​Limassol. The festival was attended by the President of the country Nikos Anastasiadis, international investors and potential buyers of real estate in the complex. This event was one of the most outstanding events in Cyprus of this kind, emphasizing the importance of government participation and support in projects of this magnitude. The authorities, the president assured, intend to further strengthen and develop the economy so that Cyprus continues its path to sustainable growth. " The event began with the blessing of Bishop Nicholas. Ms. Eleftheria Voskaridou, Marketing Director of Limassol Del Mar, expressed her admiration on behalf of the whole group, who had worked hard during the past months to make this event a reality. Special gratitude was rendered by the Cypriot composer Kostas Kakoyanis, who created the musical design of the presentation with specially written music dedicated to Del Mar. President of the Republic of Cyprus Mr. Nikos Anastasiades expressed his satisfaction that Limassol Del Mar is promoting the island abroad, attracting significant investments, and solemnly laid the first major stone in the foundation of the landmark project. The event ended with a bewitching show that included 4D screening on a 240 m2 screen that was specially built for the evening. The unique atmosphere of this event perfectly formed the image of Limassol Del Mar - a symbol of the "new wave" in the architecture of the island.